It’s the day before an ironman distance triathlon in Grand Rapids: 2.4 miles swimming, 112 miles cycling and 26.2 miles running. Gary and I arrive at Versluis Lake in the morning so I can take a quick trial swim. I put body glide on my legs and begin to squeeze into my wet suit. Ripppppp! I am horrified as an eight inch gash appears in my wetsuit right above my right knee. Yes, my wetsuit is thirteen years old, and yes, it has many other minor tears, some of which have been patched with wetsuit cement. Never, however, did I imagine that a wetsuit could be rendered completely dysfunctional in a split second. I’ve heard people described as having a ripped abdominal area, I know personally what it means to be ripped off, and I have experienced the shame of “gripping and ripping” a golf ball, only to see it dribble a few feet off the tee. But a wetsuit? The day before a major race? Not even having a chance to try out the lake? Yikes! I consult with a few triathlon officials, who recommend that I ask for advice from the wetsuit people at the race expo or use the best all-purpose solution to any problem: duct tape. Unfortunately, I didn’t have any duct tape, although Gary thinks I carry all of my possessions in my bag. Several dozen other swimmers are preparing to enter the water, but no one has duct tape. Another race official arrives with duct tape but no scissors. I ask around for a scissors but no luck. Really. Why would swimmers carry a scissors? Finally, someone says, “I think my son has a little scissors in his pocket. Joe, come over here. Can this woman borrow your scissors?” The biggest smile crosses his face, and he says, “Sure!” Gary wraps bright orange duct tape around the gash, I thank the little boy for his gift, and off I go for a twenty minute swim. It works – kind of. A few hours later at the race expo, I show my wetsuit to the swimwear rep. He carefully examines the rip to see if wetsuit cement will hold it together. The rip is long enough. I buy the wetsuit. It’s not a rip-off. It costs less and has a better quality than the wetsuit I purchased thirteen years ago. 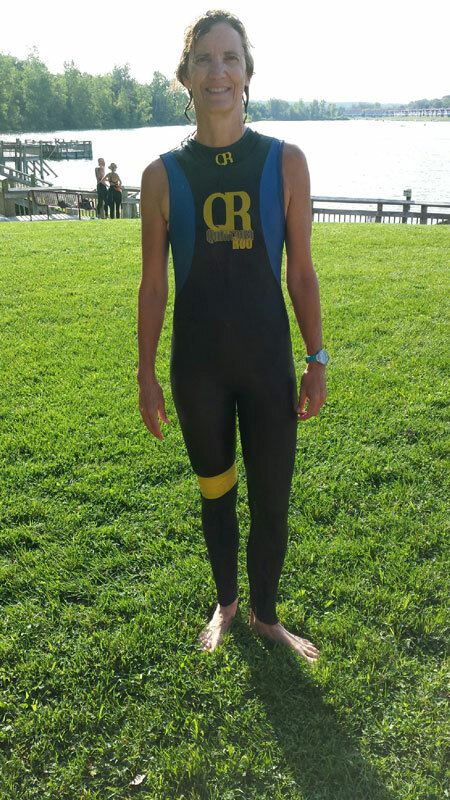 As I steadily and slowly stroke my way through 2.4 miles during the race the next morning, my new wetsuit feels great! Why did I wait so long? I reflect on the fact that my initial desire to fix my wardrobe malfunction with duct tape is very similar to the way congregations function when something is not quite right. I didn’t want to change, and neither do churches! I felt comfortable in my old wetsuit, even though it now leaked and was going to drag me down. The lighter, more advanced technology of the new wetsuit was appealing, but I’d always been told: NEVER TRY ANYTHING NEW ON RACE DAY! The truth, however, is that when the rip is long enough, some things simply cannot be fixed except by letting go of the old and trying something new. It’s the same in the church. Perhaps there is a major rip in the fabric of congregational life. Because of declining revenue and membership the current budget can no longer be sustained and staff will have to be cut. Church members are not of one mind about worship styles, the youth group has dwindled to next to nothing, and no one is stepping up into leadership. Vision is gone, the congregation is unwilling to connect with its community, structures and systems are outdated and once vibrant and buoyant programs and ministries are sinking under their own inertia. The ship of the church is rudderless. How do we fix what’s wrong in the church? Unfortunately, duct tape and bandaids are often the first choice because we’re in denial about how long and deep the rip is. Plus the mantra is now shortened to just four words, “NEVER TRY ANYTHING NEW! We just need more new members. If only Ben would stay on as Trustees chair for the twenty-fourth year. Maybe using the piano instead of the organ will help. How about a bake sale or a chicken BBQ? If Jane would come out of retirement to teach Sunday school we might have some kids. Instead of honestly evaluating our ministries, rethinking our mission and core values and seeing our future with new eyes, we play it safe, refusing to jump into the water because we fear failure. September marks the beginning of a new program year in most churches. What new wineskins are you trying out this year? Are you ready to put the duct tape away, reimagine your future and create something fresh? A new class? A new worship service? A new outreach ministry? A new attitude? Most organizations have to completely reinvent themselves every seven years in order to stay fresh and innovative. In the recently released movie The Hundred-Foot Journey, the Kadam family arrives in a quaint French village after their popular restaurant is burned down during rioting in India. They open a new Indian restaurant just one hundred feet across the street from an elegant French restaurant. This romantic comedy about battling restaurant owners, played by Helen Mirren and Om Puri, opens up our senses to different spices and flavors as well as differences in cultural understanding. Two hundred years was long enough to wait for cumin and saffron to enhance a traditional French recipe. How long is long enough to put new wine (Methodist wine, of course!) into new wineskins in your ministry setting? How long is long enough to admit reality and reinvent yourself, your career, or your congregation? It took a massive rip to remind me that thirteen years was long enough to hang on to my old wetsuit. The new one worked like a charm, and I had a rip-roaring beautiful day in the race. 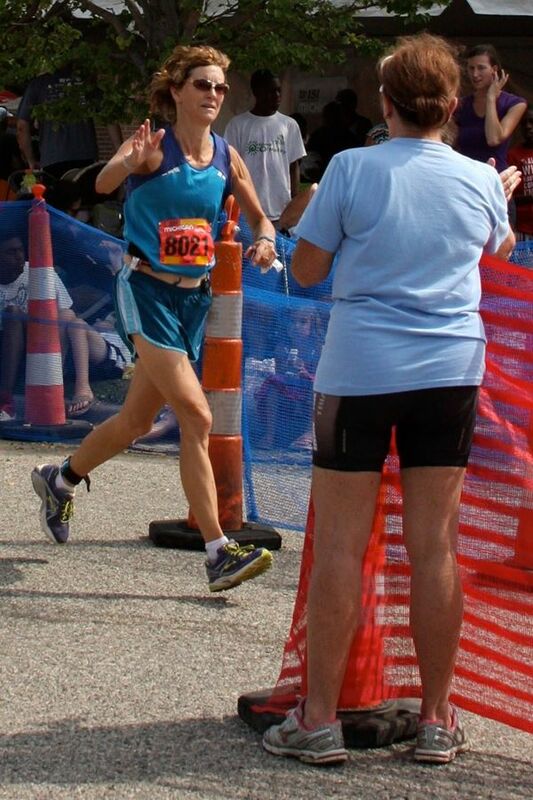 way to go, Laurie! I am always amazed at how you can weave such a great message in and around such things as a rip in your wetsuit! Congratulations on your successful Ironman challenge! Based on your article, I was expecting at least half-a-roll of duct tape to be involved. Also, still very impressed that you do marathons and even triathlons. (Three times as many ‘thons’ I am involved in.) It probably prepares you well for your job. An excellent article drawn from your own experience. In my experience I saw a parallel to my recent cataract surgery. Knowing for several years that it would be happening “someday”, but not really seeing the need for it. Yet it was only after the fact that I could realize how much my vision had been dimmed. It’s sometimes that way with the changes needed in our faith journey, both personal and church life. My other observation … while we think duct tape can fix everything, it’s not what God used. He fixed everything with nails! I’m so happy to find this on your blog. Yesterday, I attended the Southeast Iowa reception for you. You have so inspired me to lead to my congregations to stretch and try new things. To take new risks in ministry and if we fail, it’s ok … we will try something else. Thank you for your words of wisdom. I am excited to work with you during your stay in Iowa! Thanks for coming yesterday. God bless your ministry! Bishop Laurie , I was hanging on every word that you were telling us on Sunday about what millennials are wanting in churches today. I wish I would have taken notes. Would you consider revisiting that topic in a future blog post? It’s such great information for a newer pastor like me. Blessings from Van Buren County, Iowa to you!